A party hall is a good choice for a family reunion or other large event. If your guest list has outgrown the size of your house or you just want the convenience an outside venue can provide, you may be interested in finding a party hall for rent. Churches - Many churches have an activity center or dining hall that is used for church events, but is also available to community members. Look to your own faith community first - rental fees are often lower for church members. Community groups - Organizations such as the Knights of Columbus and Veterans of Foreign Wars (VFW) open up their facilities for rent when they are not being used by the membership. 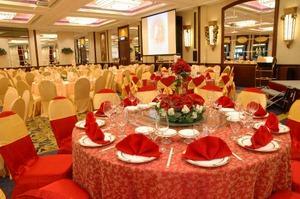 Banquet halls - Some facilities have been created exclusively as party halls for rent. Hotels - This option can be especially helpful if you're inviting out-of-town guests, as the hotel can work with you reserve a block of rooms and may even offer a group discount. Restaurants - Some establishments have rooms that may be reserved by large groups. Parks - If your definition of "hall" is flexible, the picnic pavilions at a community park can be a great open-air party venue. Recreational facilities - Locations like the local YMCA or a family fun center are great party places for kids, providing lots of activities in addition to room for the celebration. Country clubs and golf courses - Membership may be required to reserve a party space. Colleges and universities - You may think of classrooms and dorm cafeterias when you envision available spaces on campus, but may colleges offer first-class conference facilities, including banquet rooms and party halls. Before renting any hall, it is best to tour several facilities and research your options. Keep the following questions in mind to help you make a decision. What is the maximum capacity of the rooms available for rent? Will there be other events in the building at the same time? If you're hosting grandma's 90th birthday party, you may not want a high school prom in the ballroom next door. In addition, a busy facility may encourage party crashers. Is there room for the activities you are planning? For instance, if you're hiring a DJ, you need space for his setup, along with room for your guests to dance without bumping into the buffet table. Does the building have a sign that you can use to display a congratulatory message? Is audiovisual equipment available, if needed? Are there any restrictions on decorations? Some buildings will allow you to decorate the entryway while others will ask you to limit decorations to the party hall itself. A hall may prohibit candles as a fire hazard or ask that you not provide the guests with confetti, bubbles, or other substances that are difficult to clean. How much time will you be allowed before the event to prepare? Are you allowed to provide your own food and drink, or does the party hall for rent require you to hire a catering company? If you are interested in hosting a bar at your party, does the venue have a license for serving alcohol? Does the hall have waitstaff and servers available to hire? How are halls rented - by the day, by the hour, or by a block of time? Do rates vary depending on the day of the week or the time of year? Does the venue require a deposit? Is it refundable if you cancel your celebration? With the venue secured, you can relax and turn your party planning attention to other important details.